Ravens 49ers Super Bowl: The small decisions that cost San Francisco the big game. The small decisions that cost the 49ers the Super Bowl. 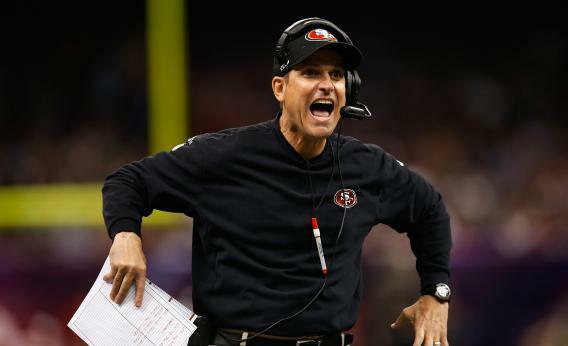 San Francisco 49ers head coach Jim Harbaugh reacts to a play during Super Bowl XLVII against the Baltimore Ravens on Sunday. Super Bowl XLVII turned out to be a close game that hinged on a few critical plays at the end—shocking, given the score when the power went out. But it also hinged on decisions that didn’t seem very significant at the time but ended up having an enormous effect on the outcome. One of the more obvious foul-ups was San Francisco’s mismanagement of its timeouts in the second half. If the 49ers had any hope of coming back from down 22, it was certainly going to be close at the end, and timeouts were going to be invaluable. Colin Kaepernick, though, burned the 49ers’ first timeout just before a first-and-10 play near midfield at the halfway point of the third quarter. It seemed as if he simply didn’t like the play call or the match-ups because there was time left on the play clock. The second timeout was called by Jim Harbaugh to prevent a delay-of-game penalty on the 49ers’ final drive that would have set up a third-and-goal from the 10 instead of from the 5. This was a debatable call. On the one hand, San Francisco would’ve been pushed 5 yards farther from the end zone. On the other, since Baltimore was taking away the run and forcing quick passes into man-to-man coverage, the extra space might have actually made things easier for the offense. Jim Harbaugh made another mistake risking a timeout on the challenge of a first-down ruling halfway through the fourth quarter. He won the challenge, but that only set up third-and-inches, a situation that ends up being converted more than 80 percent of the time (and which the Ravens did ultimately convert). There wasn’t enough upside to justify the risk that there wouldn’t be enough evidence to overturn the ruling. Had the 49ers retained all three timeouts, they would’ve gotten the ball back with about 1:22 to play and great field position, assuming they would’ve forced a Baltimore three-and-out. With two timeouts, San Francisco could have had 43 seconds left after a stop. In fact, with at least two timeouts, San Francisco would’ve had enough clock to kick the field goal on fourth down of what turned out to be its final possession, force a Baltimore punt, and then kick another field goal to win. Here’s how costly those timeouts were. First, consider the field goal/stop/field goal scenario. Typically, offenses needing a field goal to survive can score a three-pointer slightly more than 30 percent of the time when starting near their own 20-yard line. With about 45 seconds left to play, they can score about 15 percent of the time when starting near their own 20. If the 49ers played for the touchdown, they would have gained possession near midfield at worst. A touchdown from there with about 1:40 to play is about a 35 percent proposition, but with about 45 seconds to play, it’s about 20 percent. When the 49ers called their first timeout and when Jim Harbaugh challenged that first-down ruling, it was impossible to know just how crucial those timeouts would become. These numbers, though, show just how valuable they can be, particularly when compared to the importance of a no-account first-down play in the third quarter. The Ravens’ intentional safety, by contrast, was probably a smart decision. At the time, I thought it was a mistake because it put San Francisco in a position where a field goal could tie the game. But I didn’t realize how much time punter Sam Koch would be able to burn. The Ravens ran 8 seconds off the clock, thanks partially to a quirk in the rules. Since the penalty for holding in the end zone is, well, a safety, the Baltimore linemen could hold all night long without repercussion. Had a flag been thrown, the outcome would have been exactly the same. The Ravens’ fake field goal in the second quarter on fourth-and-9 at first made me scratch my head. The break-even chance of success to make the gamble worthwhile was 39 percent based on point expectancy and 62 percent based on win probability—the number is higher for win probability because it considers the fact that Baltimore was already ahead by 11 points. There aren’t enough relevant cases to know what the typical chance of success would be here, but this is an example of why going for it on fourth down is far more lucrative than coaches think. The failed conversion attempt left San Francisco with the ball at its own 5. Baltimore was able to get the ball back in great field position, which ultimately led to a touchdown. Of course, that’s not going to happen all the time, but it happens enough to matter. In the end, I appreciated the decision to try the fake because it showed that John Harbaugh was wise enough to expect the 49ers to come back at some point and that his team would need more points to stay ahead. Jim Harbaugh missed at least one fourth-down opportunity. In the second quarter, he passed up a fourth-and-2 from the Baltimore 9, but the field-goal attempt was likely the right call. There was only enough time for three more plays in the half. San Francisco had two timeouts but needed a conversion first to be able to take advantage of them. The missed opportunity was a fourth-and-2 from the Baltimore 16 toward the end of the third quarter. David Akers had just missed his attempt on fourth-and-7, but a running-into-the-kicker penalty moved the 49ers into a situation in which they should have gone for it. Two-yard conversions are successful 59 percent of the time, and the break-even success rate was only 37 percent, as the 49ers were down eight at the time, needing a touchdown and two-point conversion to tie. Jim Harbaugh deserves credit for leading his team to a dramatic near-comeback. Maybe if he’d used his timeouts more judiciously and his downs more aggressively, his team could’ve pulled off the biggest miracle win in Super Bowl history.